For anyone who has lived in New York City, one of its great pleasures is that there are so many choices for an escape — from its beaches to its woods, from the lakes to the mountains, from grand estates to hamlets and from quaint villages to rolling farmland. Best of all — they are all within driving distance or a short train ride away. After an intense week of viewing, discussing, and reviewing art at the Frieze Art Fair and attending all the gallery openings, dinners, curator tours and private viewings, I was ready for some calm, relaxing time away. My chief desire was a beautiful vista, lush greenery, cosy rooms, delicious food and an intimate setting. 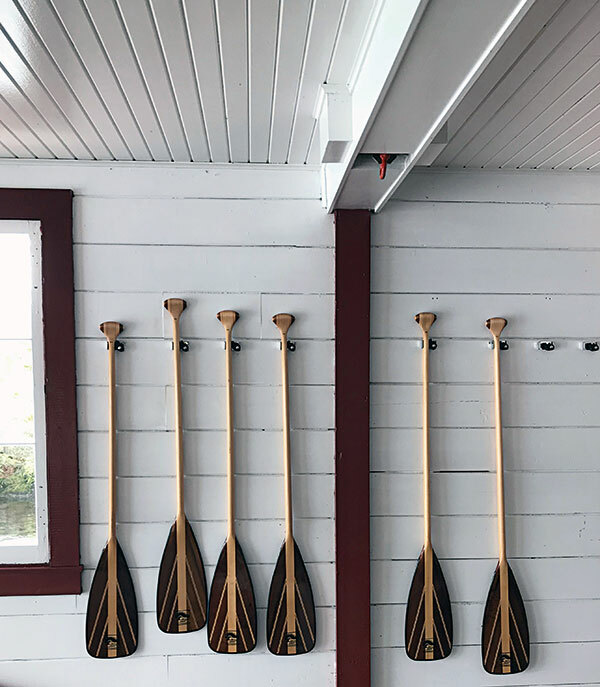 Combining all of those may seem like a tall order, but I did have in mind one place that would fit the bill…one which has topped my list for years — The Point Resort. It was the first ever Relais and Chateaux property in North America. Nestled in the Adirondack mountain range a few hours north of New York, The Point is the former estate of the Rockefeller family, dating back to the early 1900s when all the great families of the Gilded Age (the Vanderbilts, Astors, Guggenheims, Rockefellers) built their grand log cabins (that now constitute the Great Camps of the Adirondack Mountains) along the shores of those vast lakes in upstate New York. 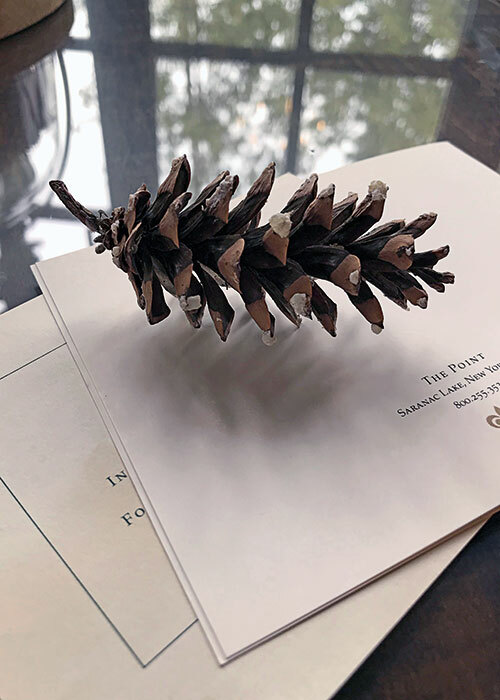 Driving up to The Point feels like taking a step back in time; and entering the vast estate feels oddly like a homecoming…which is testament to the grace, charm, warmth and kindness of the impeccable staff. 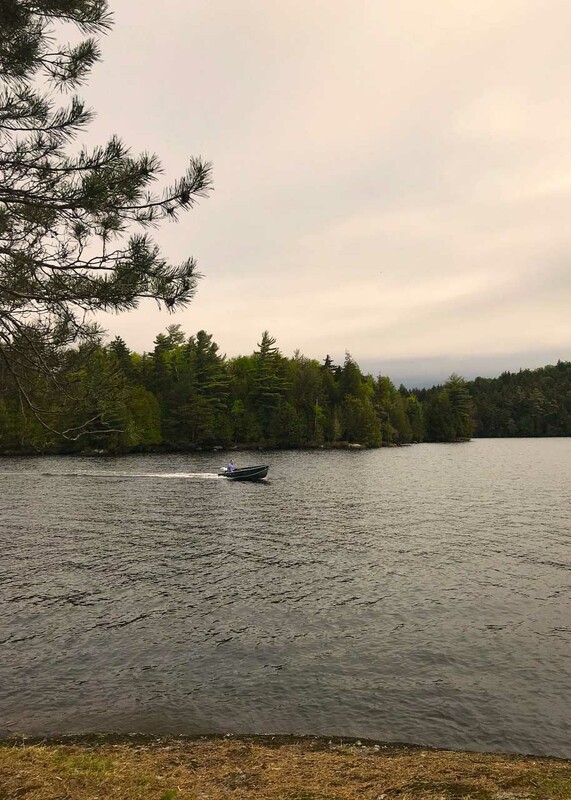 Set on 75 acres of private land on Upper Saranac Lake, the property comes equipped with 11 luxurious guest rooms scattered all over the estate. There’s also a massive lake and acres of woods and trees. Just what I was looking for. 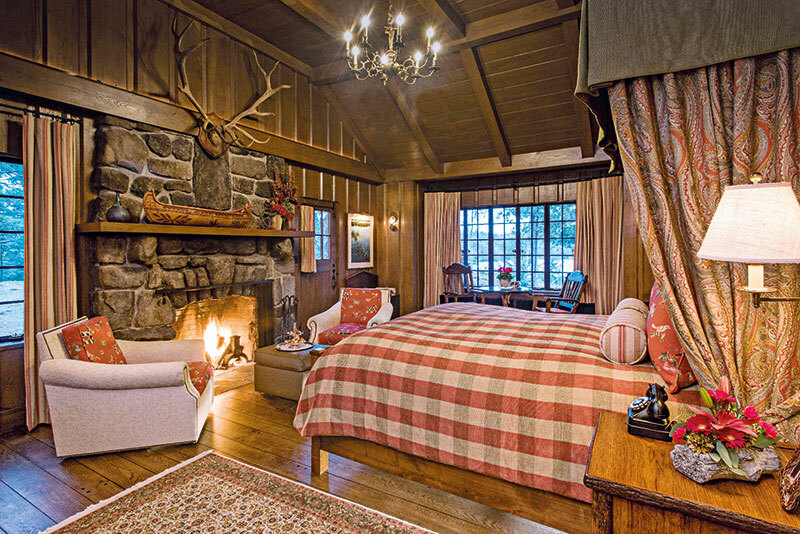 That said, I was in for a surprise because the cabins are uber-luxurious, complete with roaring fireplaces, deep bathtubs, plush four-poster beds and beautiful rustic wooden walls. It was a log cabin after all, and every detail transported me to when grand house parties would be held deep in the woods, with the crème de la crème of society ensconced in the Great Hall or the boathouse, cocktail in hand and dressed in all their finery. 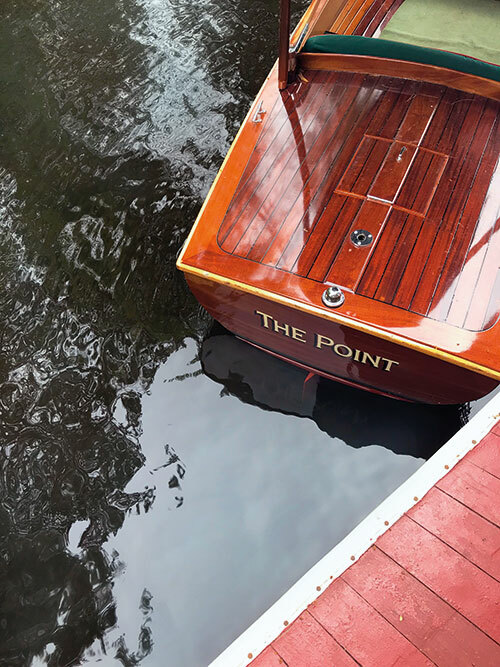 The Point has a policy of formal attire for evening dos, with guests gathering for a delightful cocktail; I attended one such evening at The Boathouse, one of their 11 guest rooms. We sailed out to the lake at sunset, in our gowns and tuxedos and had drinks served by white-coated barmen on a warm evening as we stared out at the setting sun turning the sky a shimmering gold and the lake a vision in silver…all of it making us feel like we had stepped into a more glamorous, genteel and sophisticated version of ourselves. That feeling extended well into dinner, where everyone gathered in the Great Hall to eat together under a massive wooden roof, with the fireplace crackling, the silver on mantlepieces sparkling, and formidable mounted deer heads looking down at us. There is a cosy luxury that is perfected at this Great Camp, which almost feels like it’s a private home that’s been opened up to its favourite guests. No request is too difficult, no wish too bizarre and the best part about the resort is that there is absolutely nothing that they hadn’t thought of themselves that one could have wished for. We were invited to walk through the kitchen (a beautiful space unto itself, with a majestic floor-to-ceiling fridge from the 1930s) and meet the chefs, look at the day’s menus, smell the fresh vegetables gathered from the local farms and have a glass of wine. 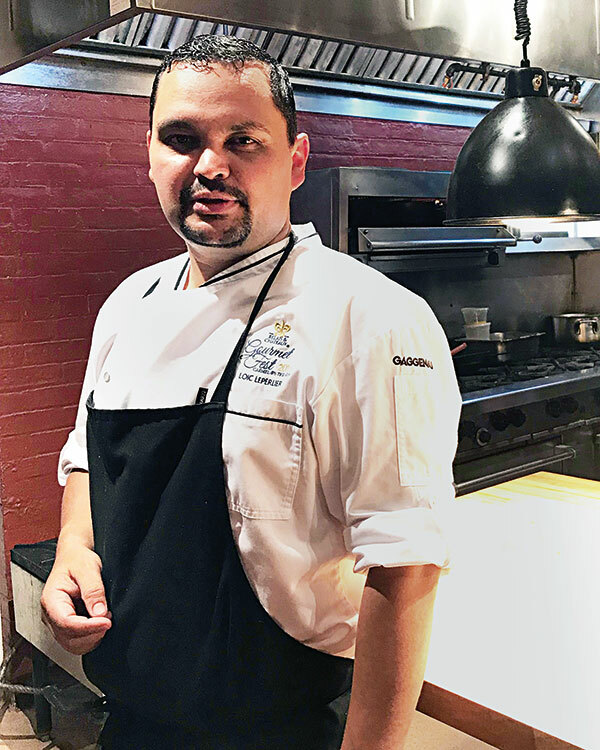 Headed by Loic Leperlier, the super talented chef, every single meal is a delight — fresh, inventive and absolutely delicious. Being an adult-only all-inclusive resort gives The Point the advantage of being able to seduce its guests with the finest wines and cuisines as well as with the ease of a quiet moment spent reading the paper or going for a hike or even just finding oneself at one of the four bars scattered around the property. There is a lot to do here — including, cycling, hiking, sailing, swimming, tennis, croqueting, fishing, canoeing and, in the winter, ice skating on the lake. 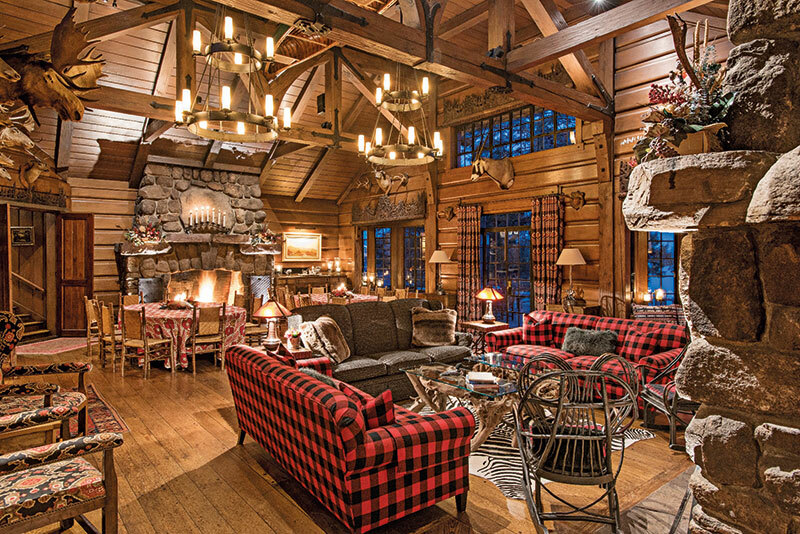 In spite of the wealth of choices, I somehow constantly found myself in front of one of the numerous fireplaces, book in one hand, drink in the other, perfectly content to let the comfort of the place lull me into a state of bliss. One of the best things about this experience was that it was a perfect combination of the outdoors (with its beautiful views, lush foliage and gorgeous outdoor fireplaces) and the indoors (plush rooms, warm sofas, snug nooks and an enviable collection of oils and watercolours), with all the trappings of high luxury to accompany it. To have this a mere hop, skip and jump away from the city is a secret I would love to keep to myself, but simultaneously, also share. Really, a perfect escape in every way imaginable.